Engineered to combat the rigors of wildland fire fighting and ideal for changing forestry terrain, providing the ultimate in heat, abrasion and puncture resistance. A heat resistant ring spun outer jacket prevents damage from sparks and radiant heat. The outer jacket is finished with our iconic “Key-Lok” polyurethane based polymer impregnation so hose will remain mildew resistant and require no drying. 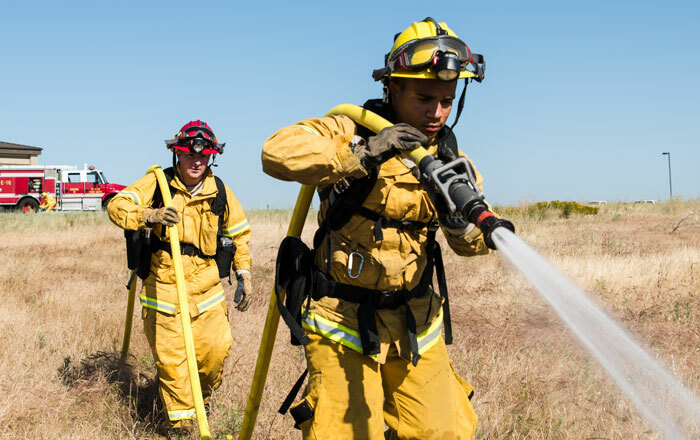 Key Hose “smooth flow technology” delivers more water at higher pressures, all in a compact, lightweight design that goes where you need it, while easy to deploy and manage. Meets USDA-US Forestry Service Specification 5100-187 Type 2. Jacket constructed with ring spun polyester yarn in the warp, with filler yarns consisting of high strength, low elongation, filament polyester for reduced weight and increase flexibility. The jacket construction is a 1-2 woven twill pattern with the 2 over-crossing on the exterior of the jacket. The lining consists of a single-ply extruded tube of synthetic polyurethane that resist ozone. The polyurethane tube is adhered to the jacket to prevent delamination. The finished product meets and exceeds all potable water MIL-H-24606 standards for the manufacturing of lightweight fire hose. Type II may also be manufactured with a thin-wall high tensile 1800 psi EPDM rubber liner. 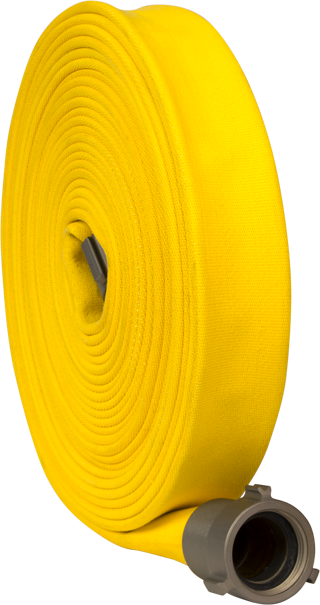 Rubber lined products are an accepted alternative to polyurethane lined hose in accordance with 5100‑187C Type 2 specifications. Type II hose is treated with a special “Key-Lok” polyurethane based polymer impregnation for enhanced color and added abrasion resistance. Expansion ring threaded or quarter-turn quick connect couplings as specified by purchaser. Couplings shall meet 5100-108 minimum requirements. The minimum burst test pressure, when tested in accordance to NFPA 1961, on all Type II diameters shall be 900 psi / 62 bar. Service test pressures stenciled on the hose shall be in accordance with current minimum requirements of NFPA 1962. Type II hose has a potential service life and warranty of 5 years, barring mistreatment that would render it unfit for service. Upon delivery, the hose shall be free from defects in materials and workmanship.